“My mind,” he said, “rebels at stagnation. Give me problems, give me work, give me the most abstruse cryptogram or the most intricate analysis, and I am in my own proper place. I can dispense then with artificial stimulants. But I abhor the dull routine of existence. I crave for mental exaltation. That is why I have chosen my own particular profession–or rather created it. At any rate, Sherlock’s need for artificial stimulants doesn’t last long because a young woman named Mary Morstan comes to 221B Baker Street seeking his help in solving a mystery related to the death of her father and a mysterious annual gift of a single pearl. She has just received a letter that she believes is related to the gift asking her to meet her the letter-writer at the Lyceum and to bring two companions if she’s mistrustful. Holmes and Watson agree to come. 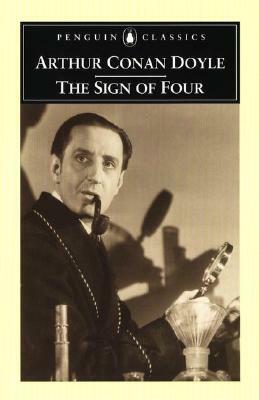 As with A Study in Scarlet, the best parts of this book are those focused on the interactions between Holmes and Watson. Watson continues to be mystified by Holmes, and Holmes is beginning to find Watson useful. Watson’s tentative courtship of Mary Morstan is sweet, but I have a hard time imagining how this relationship will fit in the future stories. The fact that I knew Watson got married but knew nothing about his wife is probably revealing. But I’m reading these books partly because I know so little about the original characters, and there’s lots of room for Doyle to surprise me with the way he uses Mary. Holmes, as it happens, considers Mary useful but believes that something as emotional as love can only hinder the cold reason needed for his work. As for the mystery, it’s fine as a vehicle for setting Holmes in motion. But, again, as with A Study in Scarlet, when the narrative turns to the background leading up to the mystery, the book suffers. And Doyle once again bases a lot of the suspense on creating an “exotic other” for readers to fear. The Indian characters, while stereotyped, don’t come off entirely badly, or at least no worse than their English cohorts, but the depiction of one character, Tonga, is unsettling, to put it mildly. This kind of thing is very much of its time, but I’ll be glad to get to some stories focused on Englishmen behaving badly. Years ago I promised my PhD supervisor (to whom you PROMISE everything!) that I would read Sherlock Holmes. I even bought the complete works. I can tell you exactly where they are sitting in the garage right this minute – unopened. I really must do something about it. Aren’t most of them rather short? Perhaps the problem is the really really big book. This might be a case for the Kindle. The novels are all pretty short, I think, but most of the works are short stories. I’ve been reading the e-book versions from Project Gutenberg. My next Holmes will be the first story collection. Mary is the best. I’m probably very influenced by the Guy Ritchie films, where she doesn’t take Holmes’ crap, calls him out on stuff, and he ends up respecting her so much that he trusts her with an investigation, but even in the books, Mary is of that school of pretty, practical governesses and other respectable working women that Doyle likes to write about. I’ll leave it to you to find out how she fits into the rest of the books, but, unfortunately, she doesn’t pop up much. I first read the Holmes stories after a friend made me watch the Jeremy Brett TV series. I found them slow going, but I’ve been thinking it is time for another try, after reading the Laurie King books and also because I’ve read a lot more Victorian authors since then – both of which I think would make for a very different reading experience. It’s been fun to read them with King’s version of Holmes in mind. I could really see the Beekeeping for Beginners Holmes in this book. I found that Holmes unconvincing when I read the novella because the version of Holmes in my head is still too influenced by the way he’s been passed down through the culture. It was nice to see that King was right about how extreme his need for occupation could be. I do intend to watch the new season. It’s in my Netflix queue–near the top even! I did notice the nicotine patches, but I saw that more as a way of updating the cigar-smoking than the drug use. Nicotine and cocaine fall in entirely different categories in my mind. Fair enough :) I only equated it to the cocaine use because he went so overboard with them!